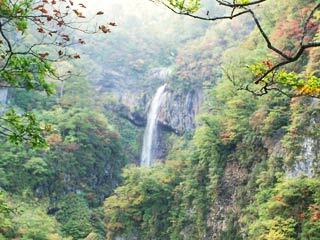 So Falls (惣滝) is one of 100 best waterfalls in Japan. It is located in Myoko city, Niigata. It is 80m high and the altitude is over 1300m. The water come from Mt. Myoko and waterfalls on Odagiri river. Koyo around this waterfalls is especially famous around this area. You cannot access to the bottom of the falls. It has beautiful face for all season. On the way from the parking to the waterfall, there is free wild Onsen and foot Onsen.